As soon as corn comes into season, we jump to make all of our favorite things with corn – creamed corn, pasta with shrimp and corn, even corn on pizza is delicious! 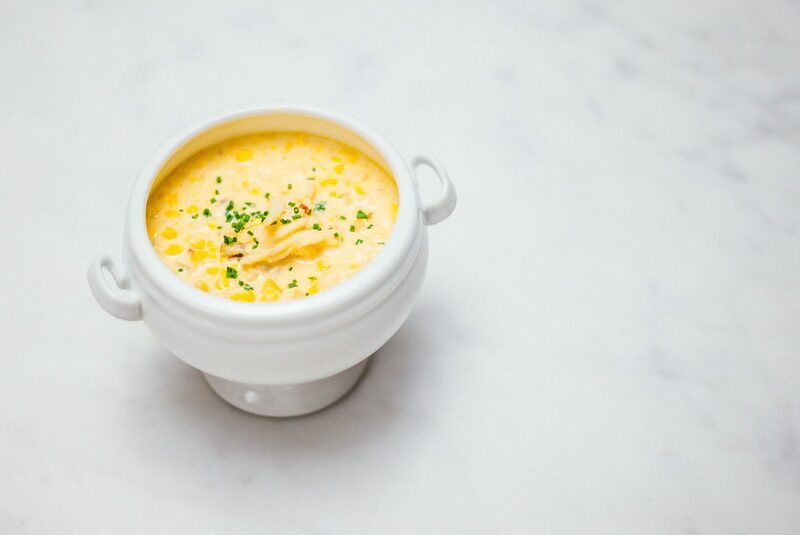 We love a good clam chowder, but if you aren’t into seafood, corn chowder is for you! We add some spice for a kick. 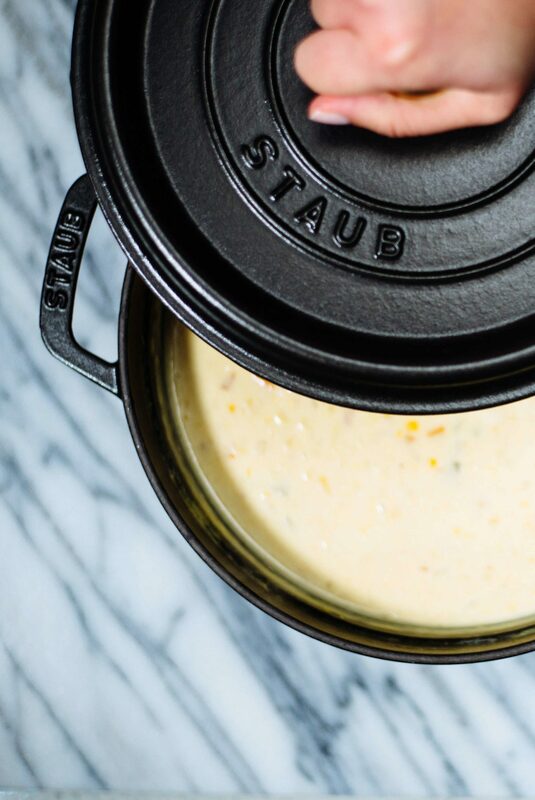 We made our corn chowder in our favorite dutch oven from Staub (c/o). There are a lot of things we love about this pot. The simple black color is so sleek and goes with everything. The colored ones in catalogs are always fun and tempting, but you can never get tired of the classic black! It’s also incredibly heavy and holds an even temperature. We love that the inside enamel is black as well, and easy to keep clean, and we think it makes a gorgeous serving piece! You can take it straight from the stove top to table, just make sure to put something down to protect your table. Another kitchen essential we used for this recipe is our chili crusher we got in Italy. We use it almost every day! We don’t own very many kitchen gadgets, but one tool that is especially useful during corn season is a corn peeler. We have this one, but also found other good options here and here. It makes quick work of stripping the kernels off the corn cob. Be sure to collect the milky fluid that comes out of the corn cob as well and add it to the chowder! 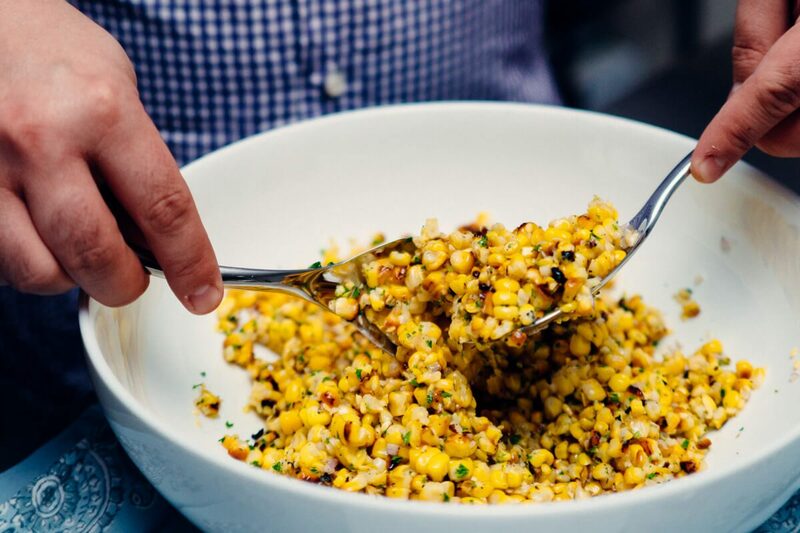 If corn isn’t in season, you can use canned or frozen corn. We tried a new product to make this recipe called vegetarian “No-Chicken Broth.” We loved it and will definitely be buying again! You can order it online here. Heat a dutch oven over medium heat and add ¼ cup of butter. When the butter is hot, add the celery, onion, and carrots and cook, stirring often, until they are soft. Sprinkle ¼ cup of flour over the vegetables and add the crushed chilis. Stir until the flour is well incorporated. Then add corn, potato, and the stock, stirring constantly as you add the stock. Simmer for 25-30 minutes, or until the potatoes are soft. When you can poke them with a fork, lower the heat and add 1 quart of half and half. Simmer, uncovered, until the chowder thickens slightly, approximately 25-30 more minutes. 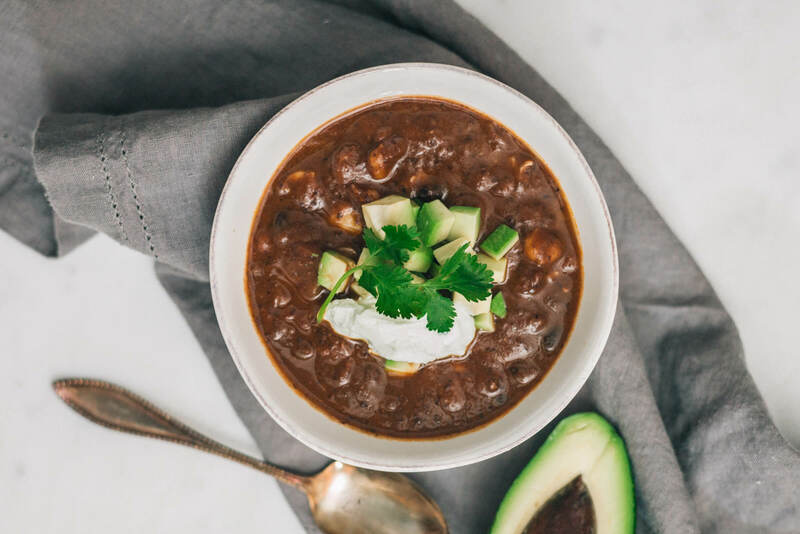 If the chowder is not thick enough, mix two tablespoons of corn starch with a little cold water in a separate bowl, then add some of the hot soup to the bowl. Whisk until smooth and add this mixture back to the chowder. Simmer 5-10 more minutes and serve topped with chives.